Commemorating the Van Hagar-reunion currently touring the States (DAMN you lucky pricks on that side of the Atlantic for that! ), The Best Of Both Worlds is the second compilation put together by Warner Records to keep the band in the headlines while waiting for a possible new record. I decided to go through this review by pointing out the made song choices from each record through the bands history and then take on the three new tunes made with Hagar. I will be saying with many albums that this and this song should have been blabla AND Im well aware that even a two-disc collection cant hold that many tunes, but bare with me here. 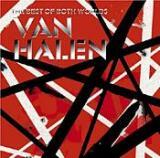 Van Halen I – Eruption, Aint Talkin´ ´Bout Love, You Really Got Me, Runnin With The Devil & Jamies Crying. Very good selection from this all-time-Classic-record, Eruption is a good way to start the album and showcase Eddie, the king of guitarkings from the start. I would have dropped Jamies Crying in favor of Ice Cream Man or Im The One though. Van Halen II – Beautiful Girls & Dance The Night Away. Dance is a good choice as one of VHs best pop-rockers, but with tunes like Somebody Get Me Doctor, Bottoms Up! and D.O.A. nowhere to be seen, better choices could have been made. WACF – And The Cradle Will Rock & Everybody Wants Some. Everybody is right on the spot but Cradle could’ve easily been dropped for Fools, Romeo Delight or the great acoustic Could This Be Magic?. Again, one good choice and one that goes with the flow. Fair Warning – Unchained. WHAT?!? That’s it? I mean that this is a great choice, Unchained is the best tune off FW but what about So This Is Love, Mean Street or Sinners Swing? This album would definitely deserve a representation of more than one song, even if that one choice is excellent. Diver Down – Oh Pretty Woman & Dancing In The Street. Good choices, but again much more energetic tunes like Hang Em High, Little Guitars or the great acapella eccentricity of Happy Trails could have replaced Pretty Woman, which is one of Van Halens more mediocre cover tunes. Dancing is just OK, Ill let that be without too much yammering. 1984 – Jump, Panama, Hot For Teacher & Ill Wait. Another Classic one that could have offered about any song off its track listing to great service. The hits are there which is only justified, but I would have dropped Ill Wait in favour of Girl Gone Bad or House Of Pain. But solid tunes each one of ´em, so no major complaints. 5150 – Why Cant This Be Love, Dreams, Best Of Both Worlds & Love Walks In. A split decision: Dreams and BOBW should definitely be here, magnificent rockers of the Van Hagar-era, but the other two I would drop. I know Why Cant This Be Love was a major hit single but to me its been one the more mediocre tunes of the band for a long time, as is the partly-too-sugary power ballad Love Walks In. Replace those two with Good Enough and Get Up, and THEN you´d be talking some major rocking! OU812 – When Its Love, Feels So Good, Finish What Ya Started & Black And Blue. Another split cut. When Its Love is one of VHs best ballads and deserved to be the hit it was and the chickenpickin´ Finish is a nice rollicky, countrified rocker, but the other two – come ooooon! With the excellent rockers Cabo Wabo, Source Of Infection and Sucker In A 3 Piece left out, the OK pop tune Feels So Good and one of the most forced DLR-copies ever, Black And Blue would be better off far away from this disc. F.U.C.K. – Runaround, Poundcake, Top Of The World & Right Now. Solid choices from one of the best releases of the Van Hagar discs. Other great tunes like Man On A Mission or In ´N´ Out could have been added as well but no complaints here. Nice, very good rock songs each one of ´em. Live: Right Here, Right Now – Live versions of Panama, Aint Talkin´ ´Bout Love and Jump. Well played, well performed pieces of these classic tunes from the F.U.C.K. tour, with everything in place and in check. Special mention must be given to the awesome vocal performance that Hagar gives on Jump here – it proves that even though he wasn’t the animal-showman that Roth excelled with, the man can sing like a beast. Balance – Cant Stop Lovin You & Not Enough. Again, I know Cant Stop Lovin You was a single and all that, but with great up-tempo grinders like Amsterdam, Big Fat Money and Aftershock nowhere in sight, a song this bland has no business on a “Best Of”. Even Don’t Tell Me What Love Can Do would have been a much better choice. Not Enough is a nice ballad with a great solo a la Eddie, so no bickering with that. Then the new songs – “WAIT a minute!”, you must be saying. “What about Van Halen III, you know, the one with Gary Cherone?” That’s what I thought when I looked at this album and its inner sleeve. There are no songs from that album in here and even on the sleeve where they list the discography of the band with the album pictures, there is absolutely no mention of that album. I guess the “Best Of Both Worlds” only leaves room for two, without the use for third wheel. A shame really cause the best rockers off the III album like Fire In The Hole and Ballot Or The Bullet could have been a good addition in introducing the band. Also, the un-chronological tracklisting can be a bit confusing at times as the moods (and singers) change on a rapid basis, but that’s a matter of person whether this is a good or a bad thing. For the end, Ill just point out a couple of things about this record. First, it sure is a damn lot better compilation than the 1996 Best Of Vol 1 (even though I love the new tunes they made with Roth for the album), simply for the fact of two discs here instead of the one disc that was included on the ´96-compilation. Second, this still is pretty far from a definite collection or a collection of the bands best work if Im concerned, but racks up all the hits and best-known tunes, so it’s a very good way to get to know the band if you´re new to Van Halen. And believe me, this is THE BAND you should know through-and-through. :) A definitive collection would require at least a 10 CD box-set if Im asked, so that’s a thing one must remember. For the bigger fans who have the studio records (like myself), I would claim that the new tunes are worth it to buy the record, theyre solid material and give good promise on a possible record of fully new material, come the time for that. And with a package like this, you’ve got the ultimate party record within one double-disc-set, if you don’t wanna carry the whole discography with ya.